Recognition of the Holy Spirit is foundational to the theological belief system of Christianity. For most Christians, this recognition is tied to the doctrine of the Trinity which teaches God is one Being of coeternal, coequal and consubstantial (of the same substance) indwelling entities of Father, Son and Spirit. Some Christian groups do not believe in this Trinitarian concept but believe that God the Father and God the Son are separate beings with the Holy Spirit being a power common to the both of them. Under this concept, it is felt that God is a family presently consisting of the Father and the Son and that Christians can become part of this God family through resurrection from the dead. Those who take this position get around being labeled polytheistic by maintaining that they still believe in only one God but define this one God as a family open to additional members unlike what they view as a closed Godhead under Trinitarianism. Still other Christians see the one God as being only the Father with the Son having been created by the Father and the Spirit being the the mind and power of the Father which is disseminated throughout the universe. For a comprehensive discussion of the relationship between the Father, Son and Spirit, go to "The God of Jesus." Regardless of ones position as to the nature of God, the Scriptures show the Holy Spirit to be a multifaceted dynamic which proceeds from God and therefore is of critical importance to our understanding. In the spring of the year, much of the Christian community observes the festival of Pentecost as a special day of worship commemorating the giving of the Holy Spirit as seen in Acts chapter two. Under the Old Covenant, this festival was part of seven annual holy days God had commanded Israel to observe. Even though the Christ event in the first century made the Old Covenant obsolete, these festivals continued to be kept by most of the Jewish Christians until the temple was destroyed in AD 70. That is why we see them meeting together on the Pentecost that occurred shortly after the ascension of Christ. Many in the Christian community continue to observe Pentecost, not as an Old Covenant requirement, but as a New Covenant celebration commemorating the visible manifestation of the Holy Spirit on Pentecost in the 30's A.D. This event is often looked upon as giving birth to the Christian Church. Jesus had been crucified and resurrected and proceeded to spend 40 days teaching His disciples before visibly ascending to heaven. Just before he ascended, He told them to stay in Jerusalem and wait for what the Father had promised. What had the Father promised? Luke 24:49: I am going to send you what my Father has promised; but stay in the city until you have been clothed with power from on high." Verse 52-53: Then they worshiped him and returned to Jerusalem with great joy. And they stayed continually at the temple, praising God. John 14:16,26: I will ask the Father, and he will give you another Counselor to be with you forever, the Spirit of truth. Verse 26: But the Counselor, the Holy Spirit, whom the Father will send in my name, will teach you all things and will remind you of everything I have said to you. John 15:26: "When the Counselor comes, whom I will send to you from the Father, the Spirit of truth who goes out from the Father, he will testify about me. We see Jesus promising His disciples that they would be gifted by the Father with a Counselor, which is identified as the Holy Spirit. The Greek word for Counselor is paraclete and is variously translated as counselor, comforter, advocate and helper. This Holy Spirit is seen as coming from the Father and defined as a counselor. It is also defined as a Spirit of truth and of power. This is what the disciples were waiting for as they continued to daily meet at the temple. Whether they knew this promised Counselor was to arrive on Pentecost we don’t know. The Scriptures don’t inform us as to whether they knew this would happen on Pentecost. Neither do the Scriptures inform us as to whether they had any idea as to the manner in which this event would take place. In retrospect, we can identify a very plausible reason for the manifestation of the Spirit on this particular Pentecost observance. There were thousands of Jews in Jerusalem to keep the feast of Pentecost. These were Jews of many different cultures, ethnic backgrounds and languages. This was a golden opportunity to present the good news of Jesus Christ to a diverse audience. Representatives from much of the known world were present in Jerusalem for this occasion. God used this occasion to manifest Himself through a sound of a mighty rushing wind and the appearance of what seemed to be tongues of fire resting on the disciples. This manifestation leads to the disciples being filled with the Holy Spirit which enabled them to speak in languages other than their native tongues. God made it very evident that something special was happening. In one great act of power, God began the process of preaching the gospel to the world. He gave the apostles the ability to speak in languages that could be understood by the many Jews of diverse backgrounds who were either visiting or living in Jerusalem at the time. They were able to understand what the apostles were saying in their native languages. For a comprehensive discussion of tongues as seen in the New Testament and as seen in some modern day Christian groups, go to my Five Part series entitled "The Tongues Issue." Acts 2:22-24: "Men of Israel, listen to this: Jesus of Nazareth was a man accredited by God to you by miracles, wonders and signs, which God did among you through him, as you yourselves know. This man was handed over to you by God's set purpose and foreknowledge; and you, with the help of wicked men, put him to death by nailing him to the cross. But God raised him from the dead, freeing him from the agony of death, because it was impossible for death to keep its hold on him. Verses 36-37: "Therefore let all Israel be assured of this: God has made this Jesus, whom you crucified, both Lord and Christ." When the people heard this, they were cut to the heart and said to Peter and the other apostles, "Brothers, what shall we do?" This crowd had just witnessed a visible manifestation of the Holy Spirit of God. Now they were given a powerful, no holds barred, straightforward message about the death, resurrection and ascension of Christ Jesus. Many were convicted. Those who were convicted asked, “What shall we do?” Peter answered, “Repent and be baptized in the name of Jesus Christ for the forgiveness of sins. And you will receive the gift of the Holy Spirit (Acts 2:38). Peter told them that the Holy Spirit, which they had just seen manifested in a visible way through the apostles, was a gift that they too could receive upon repentance and baptism. Some 3000 took Peter up on his offer. They were baptized as an outward confirmation of their faith in Christ. We must assume that those who accepted Christ also received the gift of the Holy Spirit as Peter had said. What did the receiving of the Holy Spirit mean to these fresh converts to Christianity? Did it mean that they all could now speak in languages they had never learned, just like the apostles had apparently just done? There is no Scriptural evidence to show this was the case. The Scriptural evidence indicates that what the disciples experienced was a special manifestation of the Spirit to dramatically demonstrate that the gift that Jesus had promised had truly been given. These accounts show that the Holy Spirit was available and had in-dwelled some before the Pentecost event. In most cases the Holy Spirit appears to have been present among people but not indwelling them. Indwelling of the Holy Spirit for people in general did not become available until the Pentecost event in A.D. 31. What does this gift from God mean for us today? What is the Holy Spirit, and of what significance does its indwelling have for us versus it only being with us? 1 John 3:24: Those who obey his commands live in him and he in them. And this is how we know that he lives in us: We know it by the Spirit he gave us. I John 4:13: We know that we live in him and he in us, because he has given us of his Spirit. John shows the evidence of God living in us is the Holy Spirit He gives us. What is the significance of this? Let’s look at what this same John records regarding Christ’s conversation with Nicodemus about being born of the spirit. John 3 1-8: Now there was a man of the Pharisees named Nicodemus, a member of the Jewish ruling council. He came to Jesus at night and said, "Rabbi, we know you are a teacher who has come from God. For no one could perform the miraculous signs you are doing if God were not with him." In reply Jesus declared, "I tell you the truth, no one can see the kingdom of God unless he is born again." "How can a man be born when he is old?" Nicodemus asked. "Surely he cannot enter a second time into his mother's womb to be born!" Jesus answered, "I tell you the truth, no one can enter the kingdom of God unless he is born of water and the Spirit. Flesh gives birth to flesh, but the Spirit gives birth to spirit. You should not be surprised at my saying, `You must be born again.' The wind blows wherever it pleases. You hear its sound, but you cannot tell where it comes from or where it is going. So it is with everyone born of the Spirit. What is being discussed here is being born of the Spirit and it is discussed in reference to the experience being like the wind. Now the wind is invisible, isn’t it? Being born of the Spirit is an invisible experience. You don’t experience God’s Spirit in you from the standpoint of seeing it, touching it or in some way observing it. And others don’t see God’s Spirit in you in that respect either. But, if God’s Spirit is in you, others will see the effects of that Spirit in your behavior, not different from how people see the effects of wind even though the wind itself is invisible. God’s Spirit is not physical; it is non-physical and, therefore, physically invisible. That’s why Christ compared it to the invisible wind. Ephesians 1:13-14: And you also were included in Christ when you heard the word of truth, the gospel of your salvation. Having believed, you were marked in him with a seal, the promised Holy Spirit, who is a deposit guaranteeing our inheritance until the redemption of those who are God's possession--to the praise of his glory. Apostle Paul makes some very profound statements about the Spirit of God in his letter to the Roman Church. 2 Timothy 1:6-7: For this reason I remind you to fan into flame the gift of God, which is in you through the laying on of my hands. For God did not give us a spirit of timidity, but a spirit of power, of love and of self discipline. 1 Thessalonians 5:19: Quench not the Spirit. So what is the nature of the Holy Spirit? We have Jesus telling us that the Spirit that God gives us as a gift is a counselor, comforter, advocate and helper. Jesus also shows the Spirit of God to be the power by which we are ushered into the Kingdom of God which other Scriptures equate with eternal life. John shows that having the Spirit is what identifies us as having God in us. Paul says the Spirit identifies our being in Christ. Paul says we should allow the Spirit to control us and not our sinful nature. Paul shows God’s Spirit is a Spirit of power, love and sound mindedness. Paul also shows that the Spirit can be stirred up and it can be quenched. When one looks at the many references to the Spirit of God in the Scriptures, it becomes apparent that God’s Spirit is an expression and manifestation of what God is. God is life and imparts life to us through His Spirit. God is love and imparts love and the ability to love through His Spirit. God is power and through His Spirit will manifest His power through us as He wills. God’s Spirit is counselor, comforter, advocate, helper and truth. The One God expresses Himself through His Spirit. To relate to the Holy Spirit is to relate to God. We see this demonstrated in the episode involving Ananias. Acts 5:3-4: Then Peter said, "Ananias, how is it that Satan has so filled your heart that you have lied to the Holy Spirit and have kept for yourself some of the money you received for the land? Didn't it belong to you before it was sold? And after it was sold, wasn't the money at your disposal? What made you think of doing such a thing? You have not lied to men but to God." Here we see lying to the Holy Spirit and lying to God as the same thing. Yet God does not control us through His spirit. We actually have power over the Spirit of God in that we can behave contrary to the will of God which is to behave contrary to the Spirit of God. We have to choose to be controlled by the Spirit. Paul told Timothy to stir up the Spirit and Paul told the Thessalonians that we can quench the Spirit. As humans, we will often fail in stirring up the Spirit and we often quench the Spirit by the choices we make. This is another way of saying we often sin. This can be difficult. For example, you can take a group of Christians who all believe they have the Spirit of God dwelling in them and put them in a room together to discuss a particular doctrinal issue. More often than not, they will disagree among themselves as to the correct understanding of the doctrine they are discussing. Yet they believe they are being led by the Spirit. This phenomenon has been going on for century's in Christianity as witnessed by the diverse interpretations of Scripture. I have been part of Bible study groups were someone opens the study with prayer, asking God to lead the group by his Spirit into truth. Yet, at the end of the day, there remains disagreement as to what the truth is. It should be apparent from these ever present differences on doctrinal/theological issues that the Spirit of God does not force conclusions on issues but acts as a guide to stimulate consideration of alternative ways of looking at an issue. As noted above, the Spirit is seen as a Counselor which in the Greek (paraclete) is variously translated as counselor, comforter, advocate and helper. Since the Spirit can be activated or quenched, as Paul instructs, it is apparent that the Spirit of God makes its presence known commensurate with our allowance of that presence. In conclusion, we can see that the Holy Spirit is central to our having a relationship with God. It is through the Holy Spirit that God facilitates the salvation that Christ made possible. It is through the Holy Spirit that we have power over our human nature. God expresses Himself to mankind through the Holy Spirit. 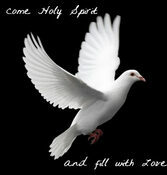 The Holy Spirit is a multifaceted expression of God's power, love and life. It is the means by which God serves as our counselor in maintaining reconciliation with Him which will result in eternal life.